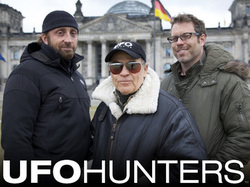 A group of men, travel America on the hunt for UFO’s. They encounter stories of aliens coexisting with our society and even working in tandem with us. Their job is to find factual evidence of these stories. The crew, led by Bill Birnes (editor of UFO Magazine), look at all options of possible UFO phenomena. They are interviewed individually, to talk about their impressions on the hunt, and the interviews include locals who hold the urban legends for the area. The different reports of aliens are interesting. Reptilian aliens, grey aliens… and there seems to be only one guy who tries to separate fantasy from reality. The scientific approach they use in trying to recreate and understand the reports of UFO phenomena adds credence to an otherwise taboo subject. They also speak to experts, such as geologists and state troopers on their opinions, some of which are surprisingly open to the possibilities. I enjoyed watching this show. I like the down to earth approach of all investigators, but simply wished Bill would take his sunglasses off while on camera. Isn’t that just etiquette?